Japanese and Western fishing use different metrics and scales for fishing lines. This table will help you to avoid misunderstandings. 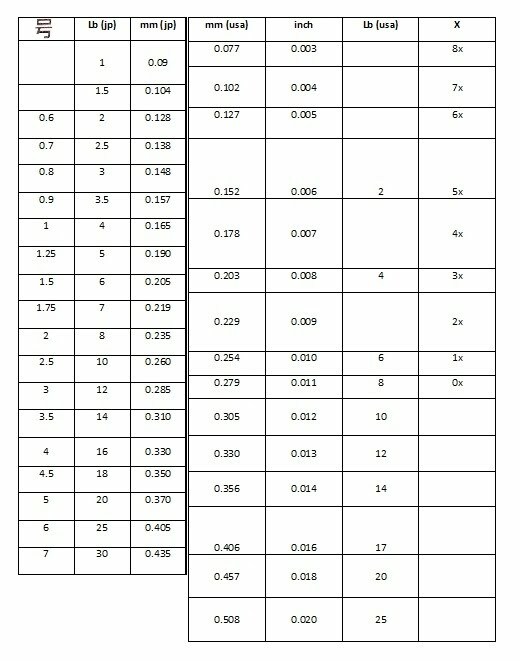 One thing that has confused me about the Tenkaratimes table is that 4 号 line is listed as .330 mm(jp) and 16 lb(jp) in the left table. Yet on the other table the list says a .330 mm ( usa) line is 12 lb( usa). Why the 4 lb difference? Seems to me a mm in Japan is a mm in the USA and a lb in Japan is an lb in the USA. Or ought to be. And a line made of the same material, nylon or fluorocarbon, if its the same diameter ought to be about the same test rating. No matter where it is made. So why isn't .330 mm line the same lb rating in both tables or both countries ? I have discovered in Japan the line sizes are based off of 1 号 = .165 mm for nylon line. This goes back in history to a standard for the size of nylon line of that size. In 1947 the company that has become modern day Toyo Rayon or Toray defined 1 号 = .165 mm. And some other changes in how line is measured were made in 1959. This diameter apparently goes back in time to the way silk line was measured. They took a standard length ( approx 1.515 m) of silk line made to be a given size, weighted it and calculated what the average diameter of the silk line per weight measured. What ever the details a silk line of average .165mm is an old standard and it became known as 1 号. Apparently this size also goes back further in history to how the thickness of silk line was measured that originated in China. In turn the issue no. ( 号) vs test is set today by JIS ( Japan Industry Standard. Although it appears there is no legal requirement to adhere to the standard. At least not strictly. Anyway. If I understand it in Japan. They take a standard length of line and measure its weight, from that they calculate its average diameter. This is different from how it is done in Europe or the USA. If you look at the Japanese Wikipedia entry for fishing line, the table on the left on the Tenkaratimes scale is closest to being accurate to the standard table printed in the Wikipedia page. The Wikipedia entry table list 4 号 = .331 mm = > 8kg for nylon line. 8kg = 17.637 lb, converted from kg. Though this is the standard for nylon line, fluorocarbon is a bit different. The Japanese Wikipedia entry for Fishing Line ( 釣り糸) where its easy enough to read the standards table and the table showing specific gravity of different types of line. ナイロンラインの強度 = the strength of nylon line. Note that the rule of thumb holds true as seen in this table and also on the Tenkaratimes table. If you double the 号 number you double the test number. 1 号 = 2kg, 2号= 4kg and 4 号 = 8kg. The paragraph below the title - なぜ1号＝0.165㎜か？ = Why does 1号＝0.165㎜ ? Explains why this size is the standard the other sizes are based on. This English language page from YGK is pretty interesting. Obviously they toot their own horn for their line since it is their web page. But is has a lot of good information about how line is measured and how it varies in production. Wherein it states this - " As for methods of labeling fishing line world-wide, the United States uses pound notation. Europe uses a combined notation of line diameter (mm) and linear strength (kg.) In Japan, Korea and Taiwan, the thickness index used to indicate line diameter is most common, but the use of pound notation is on the rise. As just mentioned, pound notation implies that the line will break at a lower value than the labeling, but in the case of kilogram notation, the labeling represents an average value of linear strength." So perhaps this is an explanation for the discrepancy in the two tables on the Tenkaratimes website. Apparently you can't just convert kg to lb, as used for specifying fishing line, since lb notation implies a breaking strength = or < the lb specified. And kg specification implies an average strength. YGK has a lot more information on their Japanese language page about how line is measured. The diagrams on this page are fairly clear about how modern day line measurements are made. Centered around 1 号 . The story about the linear length of measurement is pretty interesting too. Proving politicians or rulers are corrupt the world over and over time. The unit of length used by carpenters never changed over time. Building castles required precision. The length for measuring trade material things such as cloth was originally the same as used by carpenters but it got longer over the years. That way the rulers who demanded so many linear units of cloth of a certain length for taxes, gradually made people work harder to make "the same length of cloth". Since the linear measurement used by the taxman kept getting longer over time the weaver had to spend more time making the cloth. It's just harder to weave a yard of cloth when it becomes 10% or 20% longer as the years passed by the tax-man's ruler. The poor cloth weavers were condemned to use the opposite of the fisherman's ruler. The cloth weaver was forced to use a ruler that was actually 12 inches long, but it was marked to say it was only 10 inches long. And as everyone knows, a fisherman's ruler, that is actually 12 inches long, is most often marked to say it is 18 inches long. Anyway, a lot more than was originally asked and Nagasaurus and John answered the original question pretty well. I just set out to fix the link to the Tenkaratimes tables and got carried away. Look at gear store page to find the largest variety of tenkara level lines from Sunline, Sanyo and Daiwa.